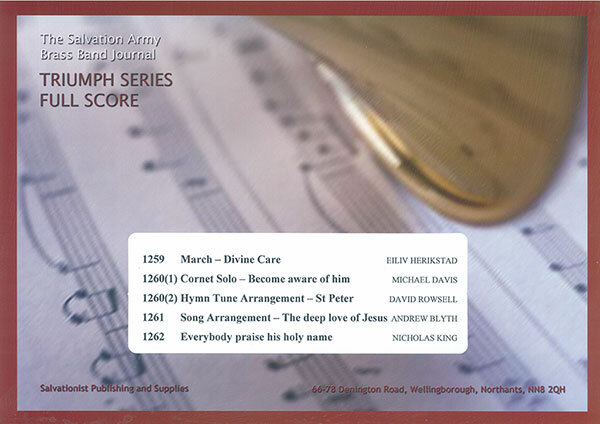 The message of this march is “God will take care of you!” The introduction reflects the beginning of the song of that title, which is presented in full at sections C and D.
A setting for cornet and band of Colonel Robert Redhead’s song “Become aware of him”, which was originally published in The Musical Salvationist. An arrangement of the hymn tune “St. Peter”, associated with the words “In Christ there is no east or west”. The strong hymn tune “Ebenezer” was composed by the Welshman, Thomas John Williams (1869 – 1944), who served as organist and choir director at various churches in an around Llanelli. This arrangement is more relaxed in style than the original and attempts to convey the freedom of the verses, “O the deep, deep love of Jesus, vast, unmeasured, boundless, free”. A bright arrangement by Nicholas King of Remco Hakkert’s song “Praise His holy name”. This article was posted in New Releases, Sheet Music and tagged Andrew Blyth, David Rowsell, Eiliv Herikstad, Michael Davis, Nicholas King, sheet music, Triumph Series, World of Brass on 3 May 2015 .